Our beloved co-worker, founding partner, and wonderful friend, Louis Manios, passed away at his home surrounded by his loving family on Sunday, January 20, 2019. Known to many as "Louie," he was a dedicated husband, loving father, loyal friend, highly respected businessman, and committed pillar of his community. Louis was a member of St. George Greek Orthodox Church, where he served on the Parish Council and as President for multiple terms. Louis attended Clemson University as well as Furman University. He was an avid outdoorsman and religious Clemson football IPTAY Heisman Donor and fan. Louis was immensely touched by a recent introduction to Clemson Head Coach Dabo Swinney and his All In Team Foundation. 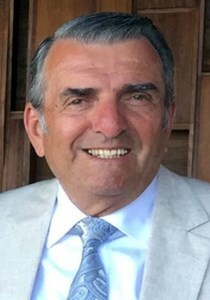 Preceded in death by his father, George Elias Manios, Louis is survived by his wife of 47 years, Gloria Ridenour Manios; sons, George Andrew Manios and Christopher Louis Manios; daughters-in-law, Erica Ahlin Manios and Amy St. Hart; granddaughters, Alexandra Rose Manios and Olympia Jade Manios; mother, Stella Manios; sister, Georgia Ann Koutsoukos (Gus); and brother, Teddy Manios. In memory of our dear friend Louis, we invite all who can to make a charitable donation in Louis’ honor. The Manios family created a “GoFundMe Page” in Louis' honor, with 100% of all donations being delivered to Dabo Swinney's All In Team Foundation. With the help of Louis’ wonderful friends, we hope to raise $25,000. Dabo’s Foundation is dedicated to helping folks in South Carolina in many ways, including funding for cancer research. Click on this link to make your contribution: www.gofundme.com/louis-manios. Your contributions will be greatly appreciated by all! You may also post condolences at www.mackeymortuary.com. With over 70 years of combined experience as licensed accountants, Louis Manios and Jerry Saad joined forces as Saad and Manios in 2003. Located in Greenville, South Carolina, with a staff of eight licensed accountants, nine full charge bookkeepers and accountants, and five support associates, our team offers a broad range of bookkeeping, payroll, tax, accounting and consulting services. Our clients include individuals, businesses, trusts, and non-profit organizations. Our business clients range from small family owned businesses to mid-size companies (typically less than 75 employees). We strive to make our clients’ lives easier by going the extra mile in all of our endeavors. Call us to discuss how we can help with your accounting, bookkeeping, tax, business consultation, payroll and other business services.